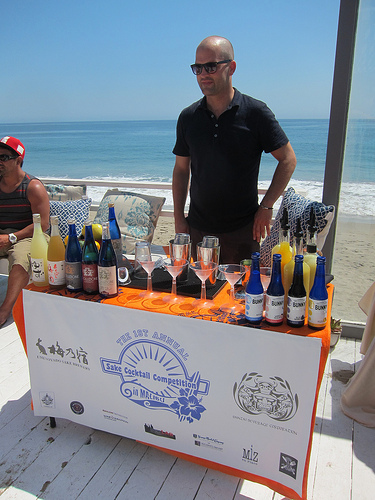 I attended the First Annual Sake Competition in Malibu a couple of weekends ago. 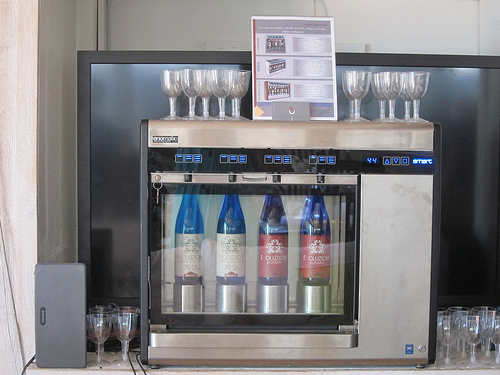 The contest was sponsored by the Umenoyado Brewery of Nara, Japan and Banzai Beverage Corporation. The USBG approved event had over 300 submissions. 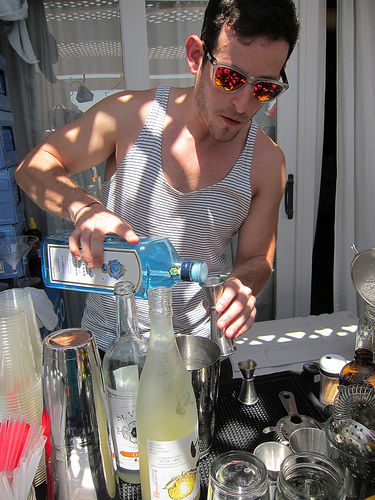 The four finalists Josh Curtis, Christopher Barragan, Michael Blum and Nikki Martin were selected to serve their winning cocktails and compete for a cash prize of $1000. 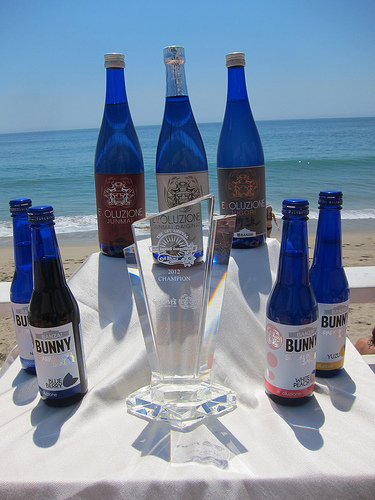 The party also launched the new Evoluzione sakes and introduced the crowd to Bunny sparkling sakes. Throughout the party and competition Bravo was filming a new show featuring Eater LA’s Kat Odell and Brenda Urban from Wagstaff Public Relations. You just might see the Minty in the background soon! Inside the private beach house, we enjoyed lunch and a sake tasting. We also had freshly shucked oysters which went really well with the fizzy sakes. I had the opportunity to try three of the four featured cocktails. 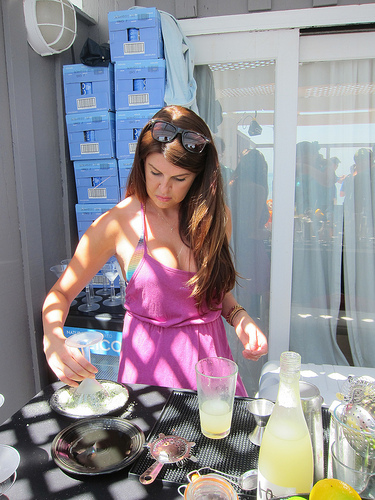 Nikki Martin runs her own catering company now and explained her drink, the Liquid Carpaccio was inspired by some of her favorite Japanese foods. The Aragoshi yuzu sake was mixed with Hendrick’s gin, agave, her homemade ginger caviar and topped with a drizzle of grape seed oil. It was also rimmed with a mixture of seaweed, kosher salt and wasabi powder. This was definitely a savory cocktail. Nikki told me she used to work at ink with Devon Espinosa. I liked her cocktail and thought it was interesting she made her own caviar which I found out were made with agar agar instead of the liquid nitrogen bath technique I knew of. At UMAMIcatessen, I love a particular cocktail called the Red Sapphire. UMAMIcatessen bartender Michael Blum, under the tutelage of Adrian Biggs, has come up with his own version, the Spangled Sapphire. With Aragoshi yuzu sake, Bombay Sapphire gin, St. Vincent’s orgeat, Gindo’s Spice of life, ginger beer and powdered mint Michael made himself, this was my favorite drink of the day. 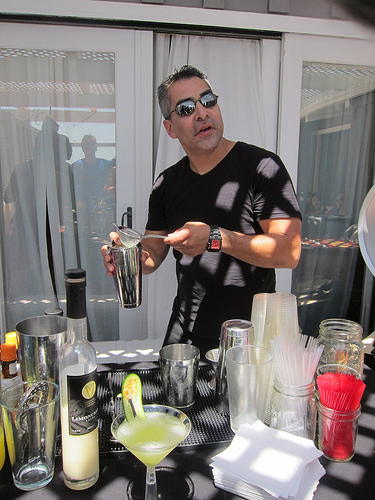 I also got to try Christopher Barragan’s Happo Biraki cocktail. Christopher works at the Fleming’s in Woodland Hills. Happo Biraki which translates as the way of the samurai warrior was a wonderfully refreshing cocktail. 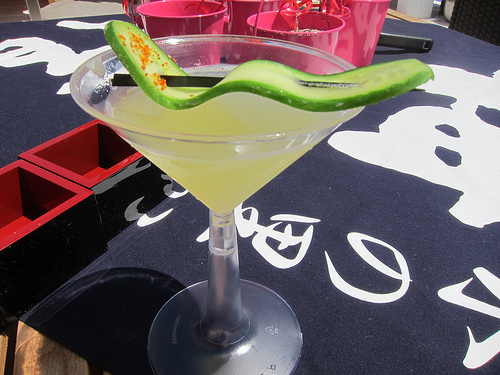 Made with Evoluzione junmai daiginjo sake, Persian cucumber, Meyer lemon and agave, Chris also garnished it with a slice of cucumber with one end dipped in espelette. You could choose to dip the pepper into the cocktail if you liked a spicy kick. As he said, he liked to give people options. The competition began with Heather Storm as the MC. First up was Josh Curtis. All bartenders were going to be judged with 5 criteria including presentation, aroma, taste, originality and best use of sake. Josh went with a relatively simple drink with Evoluzione jumai daiginjo sake, smashed cucumber, simple syrup, lime and garnished with cucumber. It sounded like Chris Barragan’s cockail, the Happo Biraki. Judges Mr. Yoshida from the Umenoyado Brewery, sake expert Eric Swanson, Eater LA editor Kat Odell and Black Lab‘s Joel Black later deemed this cocktail too simple and unoriginal. Mike explained that although he’s been bartending for 9 years, it’s only been in the last couple of years he’s been into the craft of cocktails. He came up with a plum sake, Stoli elit vodka, lime, orange juice and kaffir lime syrup cocktail. He also made his own star-shaped plum lollypop garnishes. He called his drink the Prince & and the Popper. The judges really liked the lollypops. Nikki went to work on her competition cocktail. 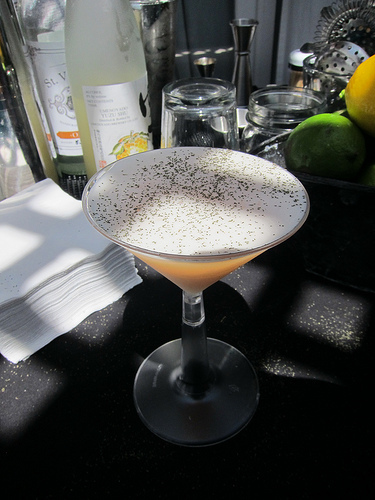 She also chose to work with the plum sake and made a drink with it, Pisco Porton, egg whites, simple syrup and lemon. It was very much like a pisco sour. It was rimmed with finely chopped shiso. Later the judges agreed Nikki had the fiercest shake. Mr. Yoshida was impressed. Chris who has been working as a bartender, sommelier and beer cicerone for 19 years made a drink with the Aragoshi yuzu sake, Hendrick’s gin, rose water, thyme. 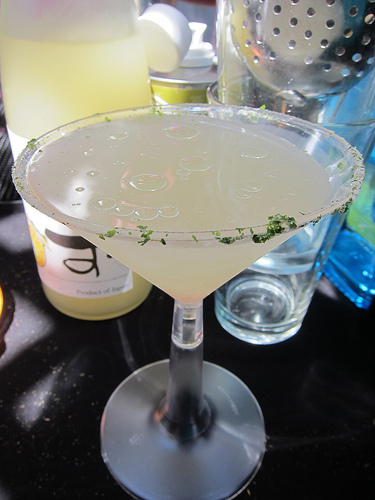 It had a lovely garnish of a lemon twist with thyme. Chris later won the competition and the $1000 but he was unable to accept the giant check at the time as he had to leave for work! It was a beautiful day in Malibu and I can’t wait to see what they come up with for next year’s competition. This entry was posted in alcohol education, alcohol tasting, bartenders, cocktail competition, cocktails, contest, events, history, hot bartenders, la cocktails, los angeles, sake, spirits, the minty and tagged adrian biggs, aragoshi yuzu, banzai beverage company, bunny sparkling sake, christopher barragan, cocktail competition, cocktails, eric swanson, evoluzione sake, fleming's woodland hills, heather storm, joel black, josh curtis, malibu, michael blum, nikki martin, sake, the minty, umamicatessen, ume no yado, umenoyado brewery. Bookmark the permalink.